Welcome back Maharanis! We wrap up the auspicious wedding of Sarita and Ankur fit for royalty at the Four Seasons in Walt Disney World where Occasions by Shangri-La bathed the venue in pure luxury. The bride herself took a page out this fairy tale romance and wore a gown that sweeped with every twinkle and swirl. 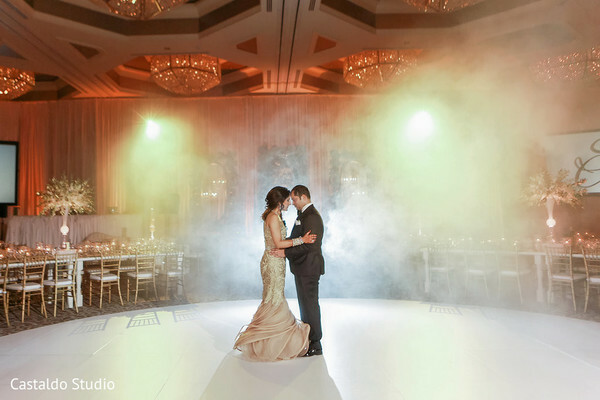 We are so amazed with the artistry work of Castaldo Studio and cannot imagine a more magical venue than one at Disney! Sarita brought on stellar wedding and design team Eventrics Weddings to help spearhead the coordination of events that included a festive sangeet and a gorgeous outdoor wedding. Peruse through these gorgeous portraits of this fairy tale wedding with all the pics that can be found in the gallery! Know of a Maharani who had such an amazing wedding that we just have to feature it? We would love to hear all about it here! See you tomorrow! Occasions by Shangri-la, Eventrics Weddings and Four Seasons Resort Orlando are members of the Platinum Guide. Love what you see? Explore their portfolios.